We had no idea what it was, though best guess was that – ultimately – it would become some sort of beetle. Was it was a worrying sort of beetle? 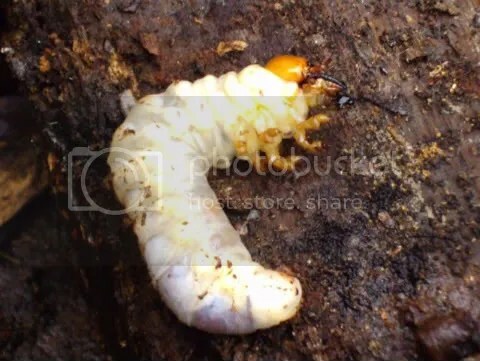 Reports of termite infestations this far north may not just be scaremongering? Eeek. Or, from it’s shape, maybe it was one of the dreaded “capricorn” beetles. Fortunately, it is not. Much less worrying and far more useful in the garden, it proved to be a stag beetle larva – Lucanus cervus. 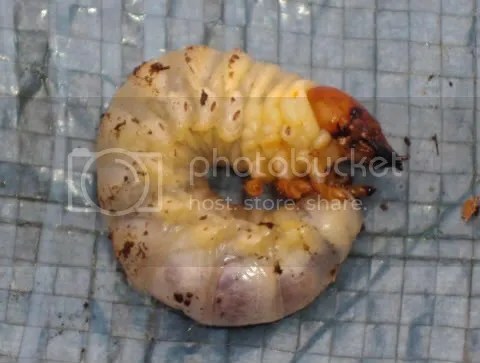 I couldn’t find my ruler at that moment but the body was about a centimetre (a chubby centimetre) in diameter and if the grub had stretched out, it would have been about 6 or 7 cms in length. Having established that it was A Good Thing to have in the garden, I popped it back in its piece of oak and left it to continue eating and growing. I suspect it will graduate to beetle form this year and I wondered about popping it in a tank – with suitable food and environment – to see if I could observe the process but I think it is more likely to have a successful transmogrification if I put it back where I found it. Stag beetles – especially the males in search of a mate – can often be seen in the evenings, flying almost upright and making a deep buzzing noise as they go past. They don’t sting and the males, despite the pincers, can’t inflict a bite on humans. The females can pack a nip (which is nice!) but rarely do.